Last year, NASA held a recipe contest for cooking on Mars. Ordinary civilians like us were invited to submit recipes based on a list of available ingredients—heavy on freeze-dried produce and various meat-flavored "textured vegetable proteins"—to be cooked and judged by crew members of HI-SEAS. 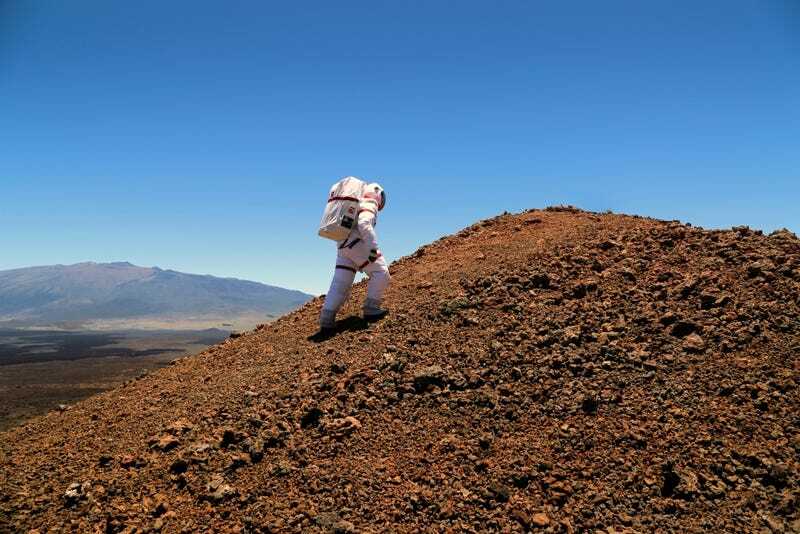 HI-SEAS wasn't actually a mission on Mars, of course; it was a simulation of one on the barren slopes of a Hawaiian volcano. (In full, the acronym stands for Hawaii Space Exploration Analog and Simulation.) But the six-person crew really did cook, eat, and blog their way through dozens of space-friendly recipes from home cooks. A disproportionate number of the recipes seemed to feature Spam, perhaps owing to the mock Mars colony's Hawaii locale. In simulating the diets of future Mars colonists, HI-SEAS was meant to study how foods keep astronauts healthy—not just physically but mentally, too. If you thought your school cafeteria's repeating menu of pizza and fish sticks got old, well, think about a repeating menu of the same old dehydrated foods three times a day. The study requires the participants to cook their own meals half of the time and for the other half to eat pre-prepared meals like creamy wild rice soup or lasagna with meat sauce. It then measures the participants' consumption patterns, moods, sensory functions like taste and smell, and overall nutrition. It also investigates how much of the so-called menu fatigue relates to the astronaut's change in sense of smell and, therefore, taste. The participants must complete nine surveys a day in addition to detailing their meals down to the ingredients' mass in grams. And while the astronaut food blog gave detailed recipes, it also included chatty mentions of celebrating birthdays and playing with Martian food—in short, evidence that food is not just for eating but also for bringing people together. The crew announced the winners for the recipe contest just before HI-SEAS ended in August. (Favorites included Moroccan beef tagine and dark matter cake.) The data from all the surveys the crew filled out will take longer to analyze, but Cornell professor Jean Hunter, one of the study's key investigators, tells Space Safety Magazine, "the crew strongly believes that their home-cooked food was a key contributor to crew morale." Alas, no data on how alcohol might have improved the astronauts' spirits. For an example of how food destroying morale, we have to look no further than Biosphere 2, another famous—or perhaps, infamous—food experiment under a geodesic dome. Biosphere 2's eight-person crew were supposedly to grow all of their own food over two years in an Arizonan dome, but the plan failed disastrously. Hunger precipitated a breakdown of social order. "They became sluggish and irritable through lack of [food], and were driven by hunger to acts of sabotage. Bananas were stolen from the basement storeroom; the freezer had to be locked," according to an essay published in Cabinet. That brings us to a good of an opportunity as any to consider whether future colonists could grow food—and enough of it—on a Mars colony. In the age of the supermarket, it's easy to forget growing food is no easy matter. "One of the things that every gardener on the planet will know is producing food is hard— it is a non-trivial thing," Penelope Boston, director of the Cave and Karst Studies program at New Mexico Institute of Mining and Technology, pointed out last year. "Up until several hundred years ago it occupied most of us for most of the time." Plants have grown space for decades now, albeit on a small scale for science rather than sustenance. Growing earthly plants in the soil, climate, and atmosphere of Mars is a different and tricky proposition. In one experiment recounted by Space Safety Magazine, plants could germinated in artificial Martian soil—taken from a Hawaiian volcano, incidentally—but their growth was stunted. Scientists have also experimented with exposing plants to the atmospheric pressure and natural light of Mars rather than using resources to mimic Earth's. Of course, the radiation and low pressure of Mars would still be dangerous to humans, which suggests either gardening in space suits or robot farmers. The European Space Agency is reportedly working on a robotic arm that can "provide crop surveillance, cutting of leaves and weeds, progressive harvesting, transport of crops to storage sites, and more." Sounds useful on Earth, too. Alternatively, hydroponics—where plants are grown without soil—has the advantage of taking up less space on cramped early settlements. Plant biologists at NASA have been studying how fresh vegetables grow in nutrient-rich water under different light, temperature, and carbon dioxide conditions. Small version of earthly crops, such as dwarf wheat, are the most promising. What's most interesting to me is thinking about how Mars colonists would get protein. It's hard enough to grow plants, can you even imagine trying to keep animals? Enter insects. You've probably heard by now that insects are the most environmentally friendly and least resource-intensive animal protein, and nowhere is that more important than a resource-strapped fledgling colony. The Chinese have considered silkworms, which could simultaneously fertilize plants and and feed astronauts. Silkworm pupae even contain twice the essential amino acids of pork and four times that of eggs and milk.